The regular arrest of Hizb ut Tahrir’s shabab in Russia is an indicator of the daw’ah’s success! On 13 November, IA TASS.RU reported: “Four residents of Chelyabinsk were found guilty of participating in a terrorist organization. They were active members of the international terrorist organization Hizb ut-Tahrir al Islami banned in Russia. The Volga (Privolzhsky) District Military Court convicted the four residents of the city of Chelyabinsk of committing the crimes under the Article 205.5 paragraphs 1,2 of the Criminal Code of Russia – “Organization of the activities of a terrorist organization and participation in the activities of such an organization. They were sentenced to imprisonment for the terms ranging from 6 to 16 years, the press service of the UFSB for the Chelyabinsk region reported on Tuesday. The blessed revolution in Sham removed the masks from many corrupt rulers in our lands and helped Muslims see the true face of those in power. Being disbelieving, unprincipled and tyrannical, the Russian authorities clearly understand the catastrophic consequences of the revival of the Islamic State (Khilafah) for them, and therefore they behave towards Muslims like a mad dog rushing to any manifestation of Islam in life, and in particular to those who call for Islam. The absence of an ideological basis of the Russian government has determined the method of government – the dictatorship. The ideologically underdeveloped power of Russia cannot provide a fundamental idea about human life, which will unite all on an ideological basis, for the multinational people of the country, which includes 85 regions and 22 republics, and even more it cannot fight ideologically against the Hizb. The ideological vacuum and the absence of ideology in the country have created a favorable climate for dawah. 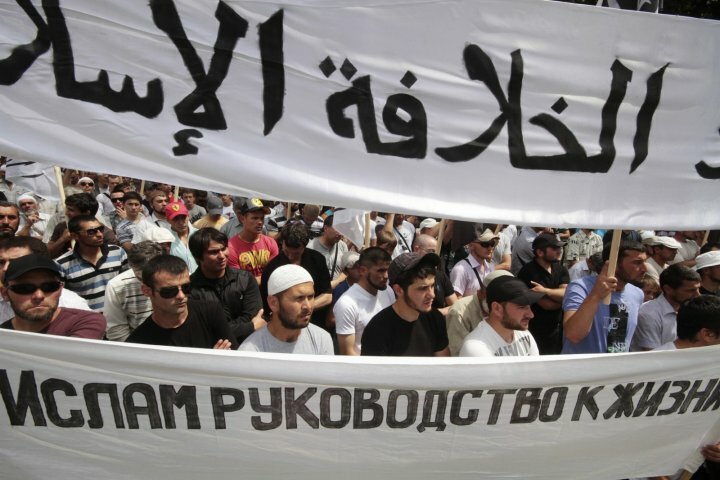 The spread of the ideological call of Hizb ut Tahrir in many regions of Russia serves as a proof of this despite the physical persecution of its Shabab. The ban of the Hizb in Russia was approved in 2003. Since then, the methods of prosecuting the Shabab have remained the same – fabrication of criminal cases, tortures and false accusations. Every year the authorities increase the prison sentences. At the last courts, the Shabab received up to 24 years in prison with a sentence being served in high-security prisons. Despite this, every year the number of Shabab joining the Hizb increases. Each time when the authorities report on the elimination of another group in one of the country’s regions, after a while the media rush to spread the news about the new detentions of the Shabab, and in a larger number than before. The Russian authorities are very afraid of the Hizb ut Tahrir Shabab and the idea of reviving the second righteous state of the Khilafah (Caliphate), because the Islam that Hizb ut Tahrir calls for is not just a religion; it is a system for human life, society and the state. This is a system that flows out of the fundamental idea of human life, which gives solutions to all the problems of a person in life. This is an idea that satisfies the mind of a person and calms one’s heart, which undoubtedly attracts the peoples of Russia. Moreover, the Russian authorities clearly understand that the revival of the Khilafah (Caliphate), in a short time, will inevitably lead Russia to the large-scale deprivation of territories originally belonging to Muslims, such regions as the Caucasus, the Volga region, between the Volga and the Urals, Western Siberia. And therefore, we see how the Russian authorities are brutally fighting against Islam and Muslims not only in Russia, arresting Shabab and imprisoning them, but participating in the murder of Muslims around the world, trying to delay the revival of the second righteous state of the Khilafah (Caliphate).